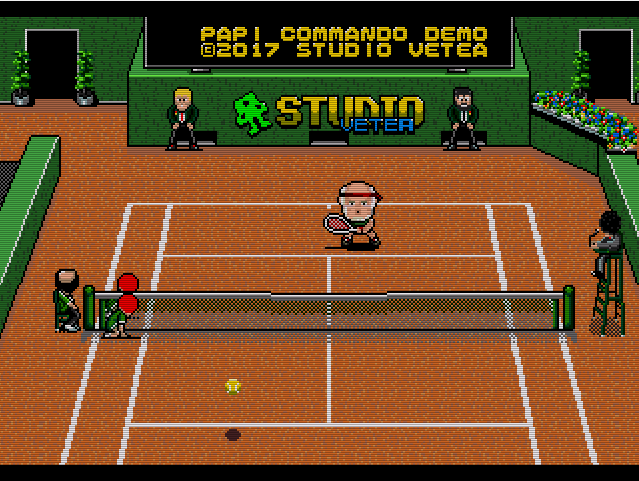 As I can create a Thread, here is this project that I talked about on another topic, Papi commando. As you may know, I'm an independent developer, who has a full-time job. I've always liked sports games on console, especially tennis games! So, I figured, why not on Megadrive ! In homebrew, sports games are rather rare or even inextent! Started 6 months ago, I realized a first demo that I then shared. In this regard, a playable demo has been widely distributed on the WEB! You can train against a Training Robot or play against a player controlled by an AI, "The Doc"! I wanted to change completely style, for a more realistic rendering and above all, change DevKit. So I turned to SgdK, fabulous devkit that allows more possibilities than Bex. Much more complete! From then on, I really exploited the graphics capabilities of the console thanks to the internal tools of SgdK! This was the beginning of a new adventure ! What I want to do is a mix between Simulation and arcade! As I work alone to do everything (Code, Artwork, sound, music) I do with my technical level and above all, realism for not doing anything. I can't use the prestigious tournament name like Roland Garros, or use the known player name ... So I'll use the world I created before, Basic City, C ++, Javascribouilles and new unreleased characters To include them in the project! I will try to create 10-20 original players as well as a prestigious tournament, the Basic City Tournament! As well as other small tournaments. Also, a 2-player mode will be provided. Also the ability to have players with their own characteristics (Power, endurance, speed, ...) and be able to improve their player with experience. I will not use the support of the Kickstarer ... Because I do not have the use! As I take care of myself and the tools I use are free, no interest. And then I do not like this support there even though it understands its usefulness for many independent developers or studio. To conclude, here is a video showing all the work that has been done to date. And the Latest video WIP 6 May 2017 ! Thanks again for your messages and support! I'll soon get you to next news. Congratulations on getting as far as you have. I watched the video and was genuinely impressed with how good the game looks and runs! I am also working on a SGDK project, and it will have sports in it as well, (although I don't know about tennis at this point - perhaps? Maybe other sports), so great minds think alike! This looks extremly cool. Hope to se a finished product!